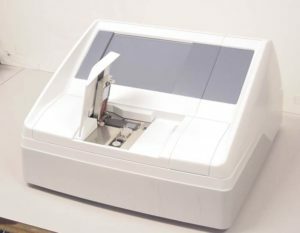 A hybridization station was required to support lab-on-a-chip activities in the field of DNA analysis. This complex project included integration of a client’s scientific research, with existing lab equipment and techniques, a custom programmed touch-panel control, software and with unique thermal- and fluid-cycle requirements. 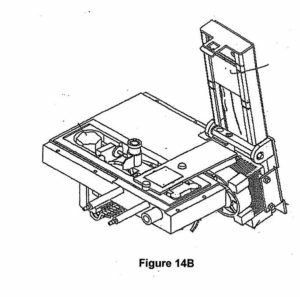 The client required several complete desk-top units to continue research, and to patent. This device included four analysis and control modules, two fluids distribution modules, pneumatic actuation, heating and cooling circuits, on-board fluids, and a touch-screen microprocessor. 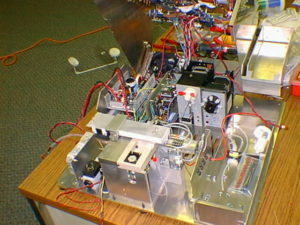 The client also required the ability to open the prototypes with a swing-top cover in order to access experimental components. 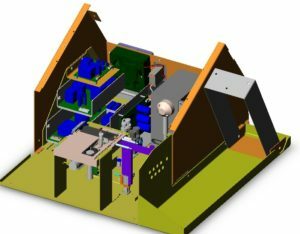 The below images demonstrate the tightly integrated components, with a focus on user-access to critical devices, such as fluid distribution module. This device was patented under US2004/0101444A1. Hybridization Station interior prototype model.